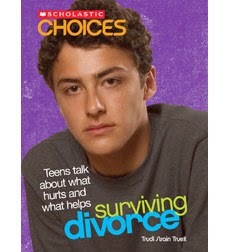 Often overlooked in children's literature, the subject of coping with divorce is addressed in Surviving Divorce: Teens Talk about What Hurts and What Helps. Each chapter begins with a teen's own story and perspective on how he/she coped with the change. A range of issues relating to divorce is covered, from feeling alone to blame to anger. Quizzes, statistics, and honest advice presented in a friendly, eye-catching format are sure to keep students reading and interested throughout. This book addresses the diversity of children not having the stereotypical family and how divorce affects them. Divorce often makes kids feel embarrassed, as they see their families as being different; angry, as others make fun of them; sad, as they have lost a parent at home; confused, as they may blame themselves; and alone, as they may not know whom to turn to. This book can be used a resource for the unit on Families. Our literature selections will include short stories, poetry, and non-fiction, and we will spend 1-2 days on various family structures. This will allow the children to see themselves in the literature and connect. For this particular book, we would begin with an interactive pre-quiz, testing their knowledge of divorce facts (e.g., How many adults are divorced in the U.S?, What state has the highest divorce rate?). Then, after discussing the answers, I will show them the book's interesting layout and each group would read one teen's story from the book. They would report back to the whole class on their story, focusing on how that teen felt, how he/she coped, and what they might say to the person if they met.